Fourth time is Fantastic! The Official C5/C6 Registry is planning a fabulous return trip to Le Mans, France. This year’s trip will commence Wednesday, June 6, 2007 (our arrival date) through Wednesday, June 20, 2007 (our departure to the US date). CLICK HERE FOR COMPLETE INFORMATION ! 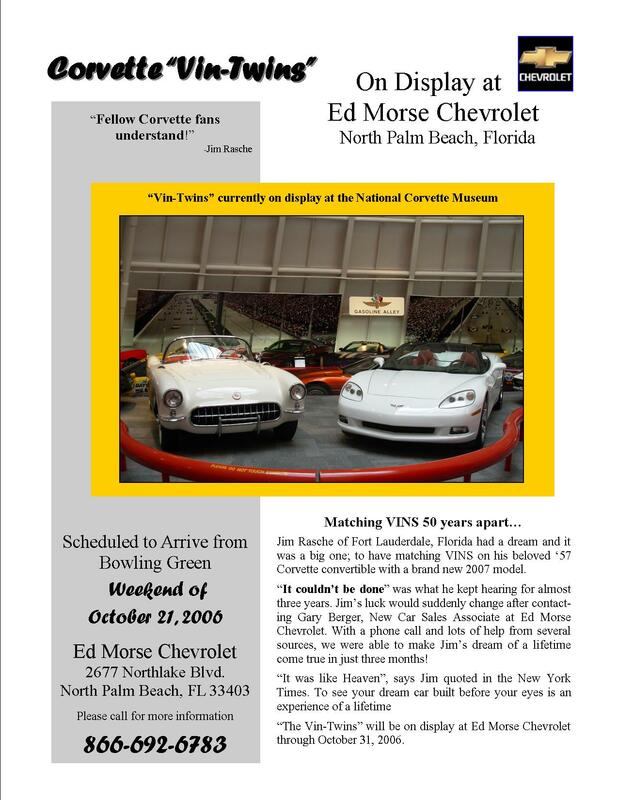 Ed Morse Chevrolet to host special appearance of the Corvette “Vin-Twins” through October 31, 2006. Jim Rasche of Fort Lauderdale, Florida and “corvette nut” had a dream and it was a big one; to have matching VINS on his beloved ’57 Corvette convertible with a brand new 2007 model. “It couldn’t be done.” was what he kept on hearing for almost three years. But after contacting Gary Berger, New Car Sales Associate of Ed Morse Chevrolet in North Palm Beach, Jim’s dream was finally in motion. With just a phone call and lots of help from several sources, Jim was able to see the birth of his second “Vin-Twin” in just three months! “Fellow Corvette fanatics understand.” “It was like Heaven”, says Jim Rasche quoted in the New York Times. To see your car built right in front of your eyes is an experience of a lifetime and is one that is cherished forever. 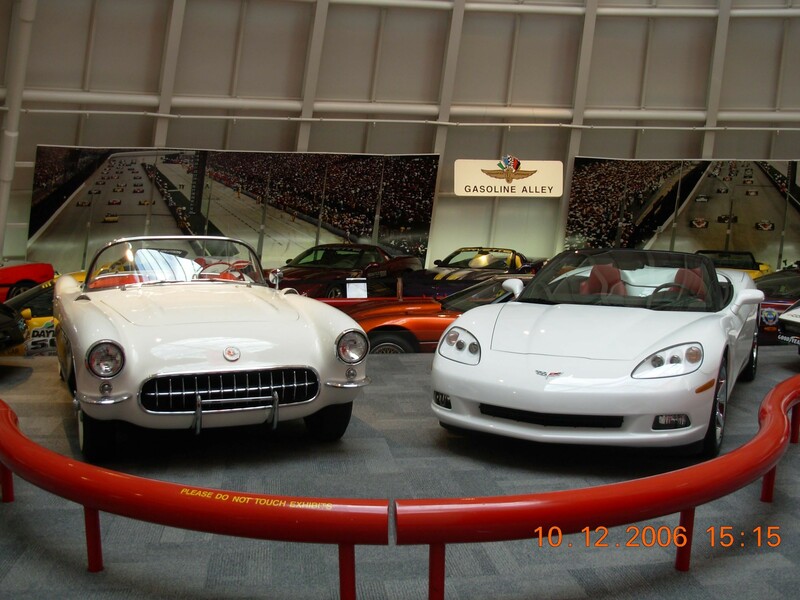 The “Vin-Twins” are currently on display at the National Corvette Museum in Bowling, Green and are scheduled to arrive at Ed Morse Chevrolet in North Palm Beach, Florida the weekend of October 21, 2006 and will remain on display through October 31, 2006. For more information please call Kim Narvaez or Gary Berger at 561-844-5262 for more information. Ed Morse Chevrolet, 2677 Northlake Blvd., North Palm Beach, FL 33403. DETROIT – Joe Spielman, GM vice president of North America assembly and stamping operations, will retire Feb. 1, 2007, after 43 years of distinguished service to the world’s largest automaker. More on the CORVETTE SS ! More News on C6 Painted Tops. At the NCM Labor Day celebration in Bowling Green, Tom Hill stated that all the 2005 and 2006 painted tops are going to be replaced. The glue/foam is merely a band-aid. The problem is that the top skin is polycarbonate and not the SMC fiberglass used on the fenders, hood, etc. Apparently it's coefficient of expansion under heat is much greater than expected. When the top gets hot (and this has been the hottest summer for a long time), the polycarbonate material expands. The magnesium frame does not -- and that breaks the glue bond. 3. the top skin blows off leaving you a frame and headliner. The fix they came up with was to replace the top film with SMC material, the same as fenders, etc. This plastic has a much lower heat expansion property. They fixed this just as the 2007s were rolling off. The recall (when it comes) will affect all 2005-6 painted tops whether or not you've had the quick fix. 2. the weight of the top will go up by three pounds. They used the poly material in the first place to reduce weight. Unexpected consequences. The dealer will receive an unpainted top for your car and will paint it locally with the same paint and process the Vermont factory uses. Should be OK. The tops aren't painted in Bowling Green anyhow so there's no new "paint match" issues introduced. DETROIT – General Motors today announced the best warranty of any full-line automaker, with coverage up to 100,000 miles or five years across its entire 2007 car and light-duty truck lineup in the United States and Canada, reflecting its success in dramatically improving the quality and durability of its vehicles. GM’s new 100,000 Mile Warranty coverage is a fully transferable five-year, 100,000-mile powertrain limited warranty with no deductible. GM also has decided to expand its roadside assistance and courtesy transportation programs to match the powertrain warranty term. Altogether, it’s the best coverage in the auto industry. CLICK HERE for Press Release. Aston Martin was victorious in the hotly contested GT1 class, the No. 009 DBR9 of Stephane Sarrazin and Pedro Lamy taking the win from pole position with a one-lap margin over the No. 4 Chevrolet Corvette C6-R of Oliver Gavin/Olivier Beretta. On June 1, 1981, after first being produced in Flint, MI and then St. Louis, MO, the 1st Chevrolet Corvette rolled off the line in Bowling Green, KY. Twenty-five years later, America’s automotive icon continues being built in this world-famous plant along with the most recent addition – the Cadillac XLR. Now it’s time to celebrate. Join us for a weekend of fun! CLICK HERE for flyer ! CORVETTE Price Increase - Round Two ! There is a VERY strong rumor Chevrolet will announce revised 2007 model year MSRP prices effective with vehicles produced on or after August 28, 2006. The revised Suggested Retail prices will affect, among other popular GM Vehicles, others, the Corvette Convertible. At this time, in the Corvette lineup, only the Convertible will be affected. Check with your dealer on other GM Vehicles. Corvette dealers received a message informing of a change from QG7 5-spoke, polished aluminum wheels to QX3 5-spoke, chrome aluminum wheels. Sold orders will be price protected at the QG7 price. However, Stock orders will be charged for the price of the QX3 5-Spoke, chrome aluminum wheels effective August 1, 2006. INDIANAPOLIS – A new specially-outfitted Corvette Z06 will serve as the official pace car of the Allstate 400 at the Brickyard on August 6. Chevrolet cars have enjoyed the honor of pacing this event for 12 consecutive years, but this year is especially significant for the brand as it’s the first time a Corvette serves as the pace vehicle at the prestigious NASCAR event. While all Corvettes are considered high-performance machines, the Corvette Z06 stands out among its counterparts. It is the fastest vehicle ever offered by Chevrolet and General Motors. With 505 horsepower (377 kw) and 470 lb.-ft. of torque (637 Nm) from its 7.0L all-aluminum, racing-inspired engine, the Corvette Z06 leaps from 0-60 mph in 3.7 seconds and has a top speed of 198 mph. It also differs from other production Corvette models with extensive use of lightweight materials, including carbon fiber front fenders and a chassis comprised of aluminum and magnesium. A racing-ready suspension and large, 18-inch front wheels and 19-inch rear wheels help keep it glued to the tarmac. Nor does the car require drivetrain modifications to satisfy its role in front of the racing pack. With a dry-sump lubrication system, the Z06’s engine is equipped to handle the highest cornering forces when traveling around Indianapolis Motor Speedway’s 12-degree banked turns. In the car’s official capacity, it is outfitted with a variety of safety equipment and highly-visible strobe lights – but is still mechanically identical to those available at Chevrolet dealerships. The Corvette Z06 for the Allstate 400 wears a unique paint scheme, inspired by an asymmetrical theme that conveys an “empathic sense of motion,” according to Kip Wasenko, the pace car designer. “We’ve used the new sixth-generation Corvette to pace several races recently and its shape is so iconic that we’re comfortable getting a little more abstract and artistic with the pace car theme and not sticking to a design that follows the lines of the car,” Wasenko said. The Corvette Z06 features broad stripes of yellow, white and blue which complement the Allstate 400 logo and resemble banners that accentuate the car’s sense of speed. The 13 th annual Allstate 400 at the Brickyard will open with a variety of exciting, fan-friendly activities, including NASCAR Nextel Cup driver autograph sessions, with Chevy Day at the Brickyard on Friday, Aug. 4. Highlights of Chevy Day at the Brickyard will include appearances by Chevrolet-sponsored NASCAR drivers in question-and-answer sessions with Riki Rachtman, the former host of MTV’s “Headbangers Ball,” on the Chevy Stage in the Hall of Fame Museum parking lot, and autograph sessions with Chevy drivers and team owners in the Pagoda Plaza. The 13 th annual Allstate 400 at the Brickyard starts at 2:30 p.m. (ET) Sunday, Aug. 6 and will be televised live on NBC. Late today, we learned of some GOOD NEWS and some BAD NEWS! The BAD NEWS is, that perhaps taking a page from the many not so scrupulous Chevrolet dealerships who have been adding $5000 or more to the MSRP for new Z06's, we have learned the new base price, before freight, and effective today, of a new Z06 is $69,175, or $70,000 with freight, an increase of $3,535 over the old price of $65,640! The GOOD NEWS is quote: "All qualified bona fide sold retail orders entered in VOMS on or before July 25,2006 and delivered to the original customer after that date will be price protected. These units will be invoiced at prices in effect at the date of production; however, the dealer open account will automatically be credited for the price increase once the unit has been delivered" according to this afternoon's dealer message CHF20060051. So... for those of you who have ordered a new Z06 and your dealer has not yet entered it into the system, or you were going to order soon, but haven't yet... It's time to grab the "Rolaids"!!! The official announcement was made July 19, 2006, but, as of July 1st, Tadge Juechter is the 5th Corvette Chief Engineer. Tom Wallace remains as the Vehicle Line Engineer (VLE), Tadge's boss. Tom has VLE responsibilities for Corvette, Solstice, Sky and XLR. Tadge is the Corvette/XLR Chief Engineer. Tadge's promotion makes him Vehicle Chief Engineer for Corvette and Cadillac XLR. Tadge has been longtime Assistant Chief Engineer of Corvette that many of our members will remember from previous registry events. Tadge will continue to report to Tom Wallace, Vehicle Line Executive and Robert Kruse, Engineering Director North America. He played a key role in the successful development and launch of the C6 Corvette and Z06. Tadge. was also instrumental in the Z06 being recognized as the only vehicle program to win the Chairman’s Honors Award. Tadge has been Assistant Vehicle Chief Engineer for the Corvette since 2001 and has played a key role in the successful development and launch of the C6 Corvette and the Z06. The first Corvette Engineer was Zora Arkus Duntov, followed by David McLellan, David Hill, Tom Wallace, and now Tadge Juechter. Congratulations Tadge! The next race for the American Le Mans Series is the Grand Prix of Utah, set for 6 p.m. MDT o­n Saturday, July 15 at the new Miller Motorsports Park in Salt Lake City. CBS will broadcast the race from 2 to 4 p.m. EDT o­n Sunday, July 16. MotorsTV will broadcast the race in Europe from 6:30 to 9:30 CET o­n Sunday, July 16. American Le Mans Radio will provide live coverage on americanlemans.com, which also will feature IMSA Live Timing & Scoring. Your C5/C6 Registry webmaster will be there... camera in hand. Repair Procedure for Painted Roofs that may separate. On Feb 21, GM released customer satisfaction program 05112 which was last revised on June 23 under version 05112D. This new version includes additional 2005 and 2006 vehicles including the Z06. It provides instruction to inspect roofs as well as a service procedure for a temporary repair that will allow the roof panel to be secured to the roof frame and allow the customer to safely operate the vehicle until a replacement roof is available. On May 24, GM announced a pending safety recall for this condition involving 2005 and 2006 including the Z06 built prior to May 31. Approximately 31,000 vehicles will be involved and dealers will be advised when a release date has been established. The replacement roof for vehicles involved in this recall will use the SMC roof instead of the polycarbonate panel. Orders for service replacement roofs will be filled first then the SMC roof will be moved into production. Corvette and Aston Martin went toe-to-toe in the 24 Hours of Le Mans, trading blows through a grueling day and night of racing. When the battle finally ended at 5 p.m. today, Corvette Racing had won the GT1 class in the world's greatest sports car race for the fifth time in six years. 5. (009) Sarrazin/Lamy/Ortelli, Aston Martin DBR9, 342 6. The Corvettes started third and sixth in the GT1 class when the 49-car field took the green flag at 5 p.m. Gavin took the first stint in the No. 64 Compuware Corvette C6.R and O'Connell was first up in the No. 63 Compuware Corvette C6.R. Gavin quickly moved from third to second on the first lap, passing the No. 007 Aston Martin and hounding the class-leading No. 009 Aston Martin, while O'Connell held position in fifth. On the third lap, O'Connell passed the No. 66 Saleen S7R for fourth. When the first full-course caution period began at 5:20 p.m., the Corvettes and Aston Martins all made early pit stops for fuel. Quick pit work by the Corvette Racing crew put Gavin in the GT1 lead and O'Connell second. At 6:08 p.m., the No. 63 Corvette C6.R spun on a slick track as O'Connell entered the Porsche Curves, damaging the wing, rear bodywork and left-front suspension. The car came into the garage at 6:10 p.m. The crew replaced the damaged wing and suspension, and 11 minutes later Max Papis took the No. 63 Corvette back into battle. After half a lap, Papis radioed to the crew, "Everything's fine. At the midpoint of the 24 Hours of Le Mans, Corvette Racing's twin C6.Rs were running second and sixth in the GT1 class and sixth and 12th overall. The No. 64 Compuware Corvette C6.R driven by Oliver Gavin, Olivier Beretta and Jan Magnussen was two minutes behind the class-leading No. 009 Aston Martin and cutting the deficit. The No. 63 Compuware Corvette C6.R of Ron Fellows, Johnny O'Connell and Max Papis encountered misfortune in the form of a clutch problem and a three-minute stop-and-go penalty that thwarted its comeback from an early-race incident. The countdown to the 24 Hours of Le Mans continues, and Corvette Racing is in the final stages of preparation for the world's most prestigious sports car race happening this weekend. Corvette is hoping to come away with another win, extending the record to five 1-2 finishes in the most recent six years at LeMans. The 24 Hours of Le Mans will start at 5 p.m. local time (10 a.m. CST) on Saturday, June 17, and will conclude at 5 p.m. local time (10 a.m. CST) on Sunday, June 18. The SPEED Channel will televise 20 hours of live coverage in the U.S., from 09:30 a.m. - 2 p.m. CST on Saturday and from 7 p.m. CST on Saturday to 10:30 a.m. CST on Sunday. Have It Your Way – RPO D30! Members, now you can have it your way by selecting RPO option D30 when you order your new 2007 C6. This is just the first evidence that there is a new sheriff in town (Chief Engineer Tom Wallace) along with his highly accomplished band of deputies as they have taken a bold step in allowing us (the customer) to have our Corvette built the way we would like and not necessarily the way Chevrolet thinks we need to have it. As with any obsession there is going to be a cost involved for having it your way – our best guess is about $500. But, this will allow you the opportunity to match (or in some cases, according to Chevrolet mis-match) all the interior and exterior color combinations you’d like! Thank you, Tom Wallace! We see this as a great start in the right direction! The "General" has released the pricing and option codes (RPO) for the 2007 Corvette. We have posted this information online, and a complete dealer order guide for download. Click Here! YPSILANTI, Mich. – A new Hydra-Matic 6L50 six-speed automatic transmission for rear and all-wheel drive vehicles becomes the second six-speed transmission variant in production at GM’s Ypsilanti, Mich. Transmission Operations. The 6L50 benefits from the expertise developed with the larger 6L80 rear-wheel drive six-speed transmission, which is also produced at YTO and initially launched in the 2006 model year. The 6L50 will debut in certain 2007 Cadillac STS rear- and all-wheel drive performance sedans and the V-8 powered SRX crossover SUV. The 6L80 debuted in 2006 on the Cadillac XLR-V, STS-V and Chevrolet Corvette. It is also tailored for the heavy-duty requirements of SUVs and trucks, and is offered on GM’s 2007 full-size SUVs equipped with the Vortec 6.2L V-8, such as the GMC Yukon Denali and Cadillac Escalade. Based on information from the National Highway Traffic Safety Administration (NHTSA) web site, the media may report that General Motors will be announcing a safety recall involving certain 2005-2006 model year Chevrolet Corvette convertible vehicles equipped with a painted roof. Some of these vehicles, primarily in hot and humid climates, have a condition in which the adhesive between the roof panel and the frame may separate. If the panel separates partially, the occupant may notice one or more symptoms, such as a snapping noise when driving over bumps, wind noise, poor roof panel fit, roof panel movement/bounce when a door or hatch is closed, or a water leak in the headliner. If there is a complete separation, the roof panel may detach from the vehicle and it could strike another vehicle and cause injury and property damage. CLICK HERE to read the notice the dealers got today. The 2006 Corvette model year production schedule is now nearly complete. As a result, the final day to order a 2006 Corvette is Tuesday, May 23, 2006. No additional 2006 orders may be accepted or changed after that date. 2007 model year Corvette orders are now being accepted. CLICK HERE , and view the video of a British TV Show's test of the Z06... Awesome! The Z06 beat out last year’s winner, the Ford GT, as well as 53 other car entries. Some 50 auto journalists and 12 auto manufacturers participated in the event held at The Oasis in Austin, Texas. This was the fourth year of The Texas Challenge, the third year for the Writers Choice Award and the second year for a GM win. The Cadillac CTS-V won the first Writers Choice Award in 2004. Some dealerships may have a replacement roof, part number 19120484, in dealership inventory. It is important that any new roofs in dealership inventory beinspected for a date code to insure the part is within the known good build dates. The supplier places two date stamps on the inside of the roof panel before it is attached to the roof frame. 4. If the code has a number between 53241 and 53051 do not use the roof. Is there a Blue Devil? Tom Wallace, head of performance cars at General Motors, says the Chevrolet Corvette Blue Devil and its 600 horsepower are set to become a reality, according to an online report by Auto Week. His main worry: how to make sure the Blue Devil is driven by people who can handle the power. Perhaps GM will start a Blue Devil driving school, he mused, adding that it would be a good idea for buyers of the Corvette Z06 as well. The Blue Devil is reportedly a Corvette Z06 with 100 more horsepower from a supercharged engine, an approximate 2,900-pound curb weight, and a price expected to hit $100,000 or more. There was no word on exactly when this Blue Devil will be available for sale, to qualified drivers or otherwise. The registry has no idea in what context Mr. Wallace made this statement, but we too are excited! A Great BIG thanks to Buzz and Jackie Nielsen for the photos of the excellent time the Registry had at Wings and Wheels Show March 26th at Fort Pierce, FL. Buzz and Jackie are Registry members Number W0497 and Buzz is the current Chairman of the Board of the National Corvette Museum. CLICK HERE for the Photos, and join us next year ! Live from the Birthday Bash in Bowling Green! 2007 Dealer Ordering information has been released. RPO 83U Atomic Orange Metallic Tint coat (a bright chromatic orange), replaces Daytona Sunset Orange Metallic said to be brighter and lighter than the 2006 Daytona Sunset Orange Metallic. Please note Atomic Orange will be a premium paint extra cost option. Finally! New interior color selections! New two-tone Modified Seats (perforated leather seating surface) with crossed flag embroidery and contrasting stitching. 19U LeMans Blue Metallic will be an extra cost option. 45U Velocity Yellow Tint coat will be a premium paint extra cost option. 80U Monterey Red Metallic will be a premium paint extra cost option. 83U Atomic Orange Metallic Tint coat will be a premium paint extra cost option. GM Z06 LS7 Crate Engine Now Available! This small-block V-8 dreams big, displacing big-block cubic inches at 7.0 Liters (427 cubic inches) and big-block power at 505 hp at 6300 rpm. It also benches 470 lb.-ft. of torque at 4800 rpm. GM is the first manufacturer to certify its horsepower and torque rating using the new Society of Automotive Engineers (SAE) test procedure J2723. Helping to create its high power and high revving capability are details such as cylinder heads with computer numerical control (CNC) intake and exhaust ports and combustion chambers - which creates ports with surgical accuracy for maximum power production. In addition, the intake valves and connecting rods are made out of high-strength lightweight titanium. 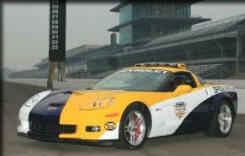 INDIANAPOLIS – Two racing icons will unite when Lance Armstrong, seven-time Tour de France winner, drives the 2006 Chevrolet Corvette Z06 pace car to lead the field to the start of the 90 th running of the Indianapolis 500 on May 28, 2006. For a record 17th time, a Chevy will pace the race, and it’s the eighth time for a Corvette to be leading the pack. Neither Armstrong nor the Corvette is a stranger to elite endurance racing. Armstrong won seven consecutive Tour de France titles, and the Corvette Z06 pace car he’ll be driving is based on the C6.R Corvette racer that has won the 24 Hours of Le Mans four out of the past five years.